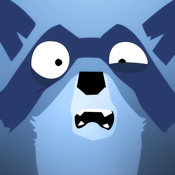 Help poor Aby, the unluckiest and clumsiest raccoon, escape from his assailants. Whether being pursued by the hunters in his native forest, by the police in town or by the bikers on Route 66.5, Aby never stops running to escape from all these dangers. Slide, jump and accelerate to dodge all the obstacles in your path. Collect coins and unlock loads of power-ups. Achieve the best score you can and complete 50 exclusive challenges. Progress through 30 levels split across 3 different universes, and take on every kind of obstacle and unique situation: a catapult, an American football stadium, elephants, and trucks, just to name a few. Get an overview of the next update by completing Story mode. He's supposed to be on vacation in the mountains, but some bogus Santas have decided to spoil his fun. Quick as a flash, he jumps on his sled and hurtles down the slopes to escape. 1 - Progress by dodging the obstacles. 2 - Take your enemies out by throwing snowballs at them. 3 - Survive a terrifying avalanche.